Sakarai Pongal: Pongal is a popular rice dish in South Indian cuisine, and Tamil cuisine of Sri Lanka. Sakarai pongal (lit. sugar pongal) is generally prepared in temples as a prasadam, (an offering made to a deity, as a thanksgiving). This type of pongal is prevalent in pongal festivals such as Thai Pongal) in Tamil Nadu, India. Sakarai pongal is a delicacy made from newly harvested rice. It is cooked with jaggery, ghee and cashew nuts and is offered to sun god. Heat the 1 1/4 cup water in a pan. Dissolve jaggery in the hot water, to dissolve easily. Let the jaggery syrup mixture comes to a rolling boil. Switch off and strain to remove impurities. Add in the edible camphor (a very tiny pinch not more than that) and green cardamom powder. In a pressure cooker dry roast moong dal till golden brown. Add in the rice and give a quick stir. Add 3 cups of water and pressure cook for3-4 whistles or until mushy. Mash the rice-dal mixture, well. Cook the mixture on medium flame for 5 minutes. As the mixture starts getting dry, add ghee and keep mixing till you get the pongal consistency. Remove the sakarai pongal from heat. Garnish with chopped cashews and raisins. Serve hot sakarai pongal, with ghee drizzled. Pressure cooking time of rice depends on the variety of rice so adjust accordingly. New rice needs little lesser water whereas old rice requires more. Sakarai pongal gets thicker in consistency after cooling down so switch off accordingly. While serving, if the sakarai pongal gets dry then add little ghee and milk. 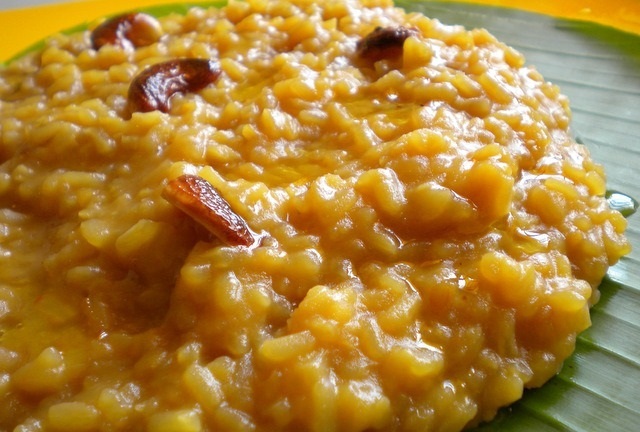 If you have any queries regarding the Sakarai Pongal recipe, please leave a comment.